These delightful chiming bells are sure to bring a smile wherever they are heard! Use them for clearing spaces, for transmuting negative energy, calming a baby, for the finishing healing touch in a soul retrieval session. Sprinkle musical magic. Shift the energy of an entire roomful of people. Take a fairy bell for a walk and sing to the nature spirits with its joyful music. Use two or three fairy bells together. Fairy bells make lovely gifts for all ages. 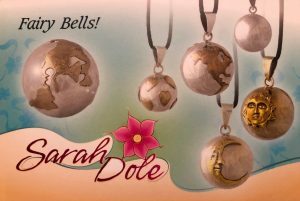 There are pendants and everyone’s favorite, the large handheld Earth Fairy Bell. You’ll have the whole world in your hand! The fairy bells are mostly pendants except the large Earth. The pendants come with a 30″ black cord for wearing around the neck. NOTE: We only ship within the United States. All the bells are German silver. 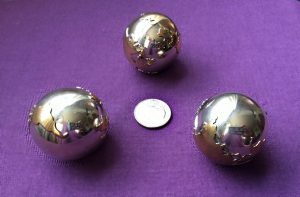 The ones with earth, sun/ moon, and moon/stars have brass overlay on the silver ball. The orange circles bell has resin with brass circles. 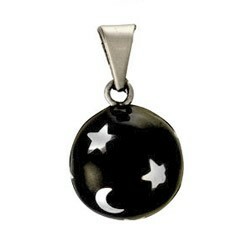 The Black Moon/Stars has black resin with silver moon/stars. The pendants range in diameter from the size of a nickel (small bells) to a quarter (medium bells). 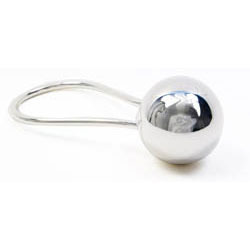 The handheld large Earth bell is about the size of a golf ball. The bell of the rattle is the same size as the large earth and has the same lovely sound.